Most of us are unaware that indoor air is more polluted than the outdoor air. Unfortunately, the issue of indoor air pollution often goes unnoticed due to lack of health awareness in India. Very few people realize that indoor air can be approximately 2-5 times more polluted than outdoor air. Tobacco smoke, mildew, mold, bacteria, dust mites, varnishes, paints, fireplaces, stoves, pet hair and space heaters are some of the main sources of indoor air pollution. The indoor air pollutants can work as a slow poison and lead to a number of serious health problems. Exposure of contaminated indoor air leads to a number of health issues such as allergies, asthma and other respiratory problems. This is where air purifiers can help you to a great extent. In this air purifier buying guide we will be sharing ‘what to look for’ and ‘how to buy’ best air cleaner for your needs. How can Air Purifiers Aid? Air purifiers have proved to be a boon in helping you improve the indoor air quality by minimizing the sources of pollutants. Air purifier removes the indoor air contaminants and creates a healthy living space. Yes, air purifiers are necessary for every household, they are a must for households with pets, pregnant women, people with babies and kids, homes or offices situated in high dust or construction areas or roadside. In addition, air cleaners are a must if any of your family members suffers from allergies, asthma or any other respiratory diseases. HEPA and Ozone are the most common types of air purifiers found in the market. In this air purifier buying guide let’s delve into the details of both the types of air purifiers. HEPA, which stands for High Efficiency Particulate Arrestor, is a high performance mechanical filter that helps in removing 99.97% of PM 2.5 particles. Impact, Interception and Diffusion are the three different mechanisms that HEPA air purifiers use to trap the carcinogen particles such as dust mites, pollens, pet dander, mold spores and cigarette smoke. The HEPA Air purifiers use an intense four-step process to effectively remove approximately 99.97% particles. Let’s have a look in this buying guide, how HEPA air filtration process work. The Pre-filters are a necessary tool that act as the first line of defence. The Pre-filters traps and remove large particulate matters with high-efficiency which serves as necessity to maintain high-life of air cleaner. The Pre-filter traps particles such as sand particles, cob webs, large dust, human or pet hair and debris. The carbon filter is designed in honeycomb structure which is filled with treated activated carbon with high grade absorption value. The filter has a high rate and high absorption capacity to trap the pollutants. The filters also help in increasing the life of next-stage HEPA filters. The specially treated carbon filter traps particulates such as VOC, Odour/ Foul Smell, gases such as oxides of Sulphide Sox, Formaldehyde, Hydrocarbons and Hydrogen Sulphide H2S. 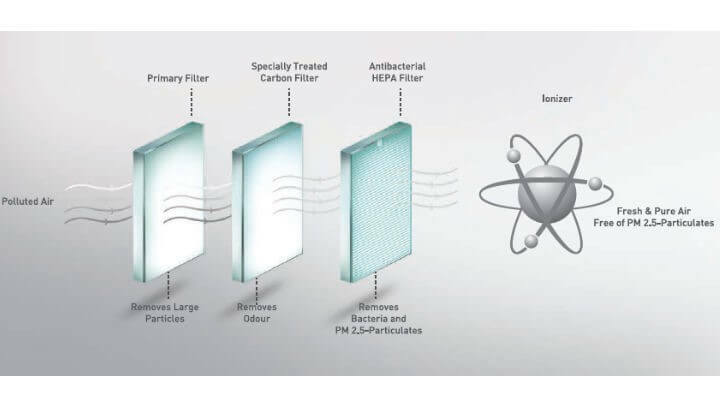 The Anti-bacterial coated HEPA filters have been developed with a superior Japanese technology that helps in trapping PM 2.5 SPM (suspended particulate matter), which are as small as 0.3 microns and have an efficiency of trapping 99% of the contaminants. HEPA filters also trap the indoor carcinogens such as PM 2.5 particulates, pollens, allergens, mold and fine dust and cigarette smoke. The ionizers discharge electrically charged ions mixed with fresh air which sticks to the particles present in air. The ions either force the pollutants to stick to the walls or other surfaces within the room or help in trapping them on an electrically-charged collection plate near the ionizing unit. When these particles are removed from the air, the ionizers improve the air-quality. Ozone air purifiers produces Ozone gas, a powerful oxidizing agent that has an exceptional power to deactivate bacteria, viruses and other harmful micro-organisms present in the indoor air. The Ozone air purifiers use oxidation. The process enters the outer cell wall of the bacteria and other micro-organisms in order to kill them. The Ozone restricts the bacteria and micro-organisms to build their immunity to Ozone as a result of the oxidation process which occurs on the wall. Ozone is an unstable gas and as a result decays the diatomic oxygen under normal atmospheric conditions. Clean Air Delivery Rate (CADR) is a measure of the purified air delivered by an Air purifier when it operates at its highest speed setting. The measurements of CADR combine both the amount of airflow and particle removal efficiency. The higher the CADR rate, the faster will the purifier filter the air. If you have a large space, look for air purifiers that have a higher CADR rating. KENT Aura is suitable for installation in a room size of up to 27 square meter where KENT Alps is ideal for installation in room size of up to 37 square meter. The Air change rate (ACR) per hour shows exactly how many times the unit can clean the air of the room during an hour. An air purifier with 4 ACH indicates that the air will be cleaned after every twelve minutes. A compact air purifier is relatively inexpensive, light-weight and small in size. Though these air purifiers are small in size, they still provide quality filtration. The portable air purifiers with HEPA filters have the ability to remove ultra-fine particles, pollen, dander, chemical vapour or fumes such as VOCs and smoke. Whether you need an air purifier for a hotel room, small office or a dorm room, light-weight and portable air purifiers are an ideal option. Some of the portable air purifiers offer limited speed setting (usually these come with single speed setting). These purifiers also require frequent cleaning and maintenance. As these are compact in size, you may need multiple units to purify the air in every room. HEPA: Ensure that the air purifier uses a tested and certified multi-stage HEPA technology that can efficiently trap harmful pollutants which can cause serious health hazards. Anti-bacterial Coating: Check whether the HEPA filter has a special coating to eliminate bacteria from the air. Presence of Carbon Filter: Check whether the air purifier has specially treated carbon filter with a high grade absorptive value for better absorption of odour and foul smell, cigarette smoke, dust, pet odour, etc. Child- Lock: Child lock feature ensures that the air purifier settings is not changed by kids or leads to any kind of injuries. Purifying Capacity: Check the CADR to ensure that the air purifier instantly purifies the air inside the room. Air-Quality Monitoring: Check whether the air purifier has an air-quality monitoring system in the room to adjust the clean flow of air in accordance with the air quality. Generally, it is quite difficult to filter air in a large area or open space as a result of inadequate air circulation. Family areas, large living rooms, especially those which have a high ceiling, make it difficult to purify the air. If you are planning to place the air purifier in a large room, always attempt to direct the purified air exhaust from the air purifier to direction of the inhabitants. When placing the air purifier inside the room, ensure that the vacant space around the air purifier is 18” or more. If you need to place the air purifier in the bedroom, place the unit approximately 6-10 feet away from the headboard of the bed. How many air purifiers you need depends upon the size/rooms/floors of your home. Just like AC/fan/cooler, one air purifier works for only one room/hall at a moment. Since it too comes in portable models, you can use it to clean different room’s air at different time. Maintenance Cost: Air purifiers function smoothly provided you maintain them properly. Before buying an air purifier, ensure that you have a clear idea about the amount you need to spend on the cleaning and maintenance of the air purifier. Filter Replacement: If you plan to buy a HEPA air purifier, check how much will the filter replacement cost. Life a filter depends on the air quality and usage. Generally, the life span of a HEPA filter is 2000 hrs. The filter needs to be replaced after every 7 months or on the indication of the filter change LED. Automatic Monitoring: Check whether the air purifier has automatic monitoring option to detect the pollution levels in the room. Air purifiers come with an infrared detector monitors that particulates in an area and accordingly adjust the speed. Noise Level: Considering the noise level is important, especially if plan to keep the air purifier in your bedroom. It is advisable to pick a large unit and run it at a low speed for better efficiency and quietness. Power Consumption: Similar to all appliances, different types of air purifiers need different amounts of energy to operate. As air purifiers need to function continuously, you need to consider the utility bill before buying a purifier. Most of the air purifiers generally use approximately 50- 200 watts for proper functioning. Prefer one that consumes lesser energy. Manufacturer Reputation: When buying any air purifier, ensure that you consider the reputation of the manufacturer. Read the reviews to learn about the experiences of the customers before making the final decision. Choose a manufacturer who has a good reputation in the industry and provide top quality products. Warranty: If you are planning to buy an air purifier for a long term use, ensure that you check the warranty to avoid issues in the long run. Before buying a product, get a clear idea whether the parts of the air purifier such as motor, fan or the electrical components are covered under the warranty. After-Sales Service: Before buying an air purifier, check the pre and post demonstration or installation services option provided by the manufacturer in your region. Ask the manufacturer about the maximum time, ensure that the manufacturer provides prompt after-sales services in case there is a problem with the purifier to avoid any inconvenience. 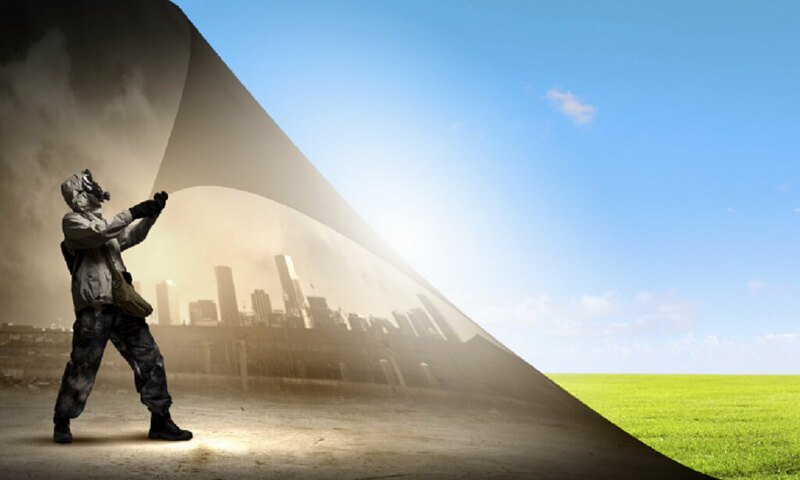 Effectiveness: The effectiveness of air purifier varies among different models and the capacity to remove different amounts of airborne particles from air. In addition, ensure that you consider the square footage in conjunction with the effectiveness to measure its performance. KENT, a leading name in the healthcare industry products, aims to make the world a healthy and happy place to live. With the increasing concerns of air pollution, KENT has come up with a range of air purifiers that use state-of-the-art HEPA air purification technology to make the indoor air free of pollutants that lead to a number of health problems. The air purifiers by KENT effectively removes 99.9% pollutants such as dust, cooking and paint fumes, bacteria, Particulate Matter (PM 2.5), formaldehyde and cigarette smoke commonly found in homes and offices. Being an ISO 9001:2008 certified company, KENT has been a pioneer in innovating technologically advanced health care products that enable you to stay safe and healthy. Q. What kind of Air purifier do I need/buy? A. The type of air purifier that you need depends on the size of the area that needs to be cleaned. It also depends on the type of contaminants present in the area. You can find air purifiers that meet your specific purification needs and requirements. Q. Can you run the air purifier throughout the day? A. Yes, you can run the air purifier throughout the day. The power consumption is quite low, so you don’t need to worry about the electricity bill. An air purifier consumes 1/40th of the amount of power an air conditioner consumes. When it comes to the filter life of an air purifier, it depends on the usage or quality of air. Q. How long will the filters last? A. The life of a filter is directly proportional to the pollution level in the surroundings and pollutant holding capacity. A filter will generally last for a longer period of time in an area that is less polluted. In general, the filters last for approximately 7 months with 6-8 hours of daily average usage. Q. Does the CADR change with the fan speed? A. CADR is specified for the highest speed setting. Users may lower the settings to reduce the noise, which may have an impact on the efficiency of the air purifier. Q. Will an indoor air purifier make any difference considering the amount of outdoor pollution? A. Yes. The reason is indoor air is more polluted than outdoor air. As we spend almost 80% of the time indoor, it is necessary to install an air purifier to avoid breathing problems, asthma and other health issues. Q. How many air purifiers do I need? A. Ideally, bedrooms and areas with high traffic need to have one air purifier. As it is necessary to ensure that you sleep in a clean room, ensure that you have an air purifier in your bedroom. As the respiratory system slows down at night, you may find it difficult to breathe easily if the air quality is low. Q. Do air purifiers make a lot of noise? A. The level of noise an air purifier makes varies with the speed. Most of the air purifiers are generally not so loud even when they are on the highest speed. Even though, it is advisable to run air purifier at high speeds when you are not in the room. On lower speeds, air purifiers make low noise. Q. Is it difficult to change the filters? A. The filters present in the air purifiers are quick and easy to change. Replacement filters come with all the instructions. Still, you can always contact the service team to change the filter. Q. When do I need to change the filters? A. The frequency of changing the filters depends on product to product, brand and model. Some of the air purifiers may have an indicator which will notify you when you need to change the filters. Some of the other filters have a designated time period within which you will need to change the filter. Q. What are the essential features that I need to check? A. When buying an air purifier, there are a number of features that you need to consider. Some of the essential features you need to check are the CADR, power consumption, noise level, handles, digital controls, timer settings and fan speeds.